Slow Cooker Hungarian Goulash is a humble stew loaded with chunks of tender, melt-in-your-mouth beef and vegetables. A rich, beefy broth flavored with sweet paprika makes this a true comfort meal. 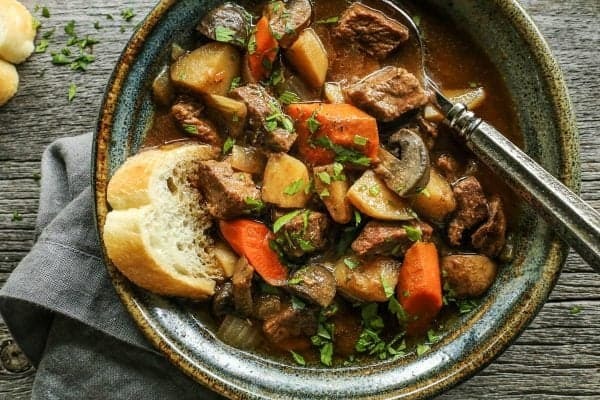 Mom shared a recipe with me for Hungarian goulash awhile back, saying that it tasted very similar to what they ate during their visit to Hungary. My sister’s family lived in Romania for a couple years, so it was a great opportunity for my parents to visit that area. I tucked the copy away with my pile of saved recipes, knowing some day I’d give it a try. When I was craving a comfort meal, I studied that goulash recipe Mom gave me years ago. Her handwritten notes told exactly how she had changed the recipe to more closely mimic the bowls of stew they had enjoyed on their trip. I also asked my sister Cheryl about her own Hungarian goulash recipe memories, as I knew her family ate this stew regularly when they lived over there. She embellished upon Mom’s recipe notes and then gave me a little background on how they used to eat goulash. I have since created this recipe for Slow Cooker Hungarian Goulash. It’s rich in beef flavor and oh-so comforting, absolutely perfect for a chilly day. My sister and her husband Dave and two young kids lived in Oradea, Romania for two years. Cheryl shared that whenever their family traveled from the airport in Budapest, Hungary to Oradea, they would stop at a small roadside panzió (Hungarian for boarding house, small hotel, or bed and breakfast) along the way for a bowl of hot goulash. Romanian friends had recommended this particular panzió to Cheryl and Dave. The owners cooked the goulash in a big cast iron pot over the fire, and then served the humble stew with big loaves of fresh, crusty bread for dunking and swiping up every last drop of goodness. I asked Mom and Cheryl to send me a few pictures from the time they spent together visiting Budapest and Vienna, Austria that summer, when my parents ate their first Hungarian goulash. I am sharing a few of those photos after the recipe, if you’d like to take a look. 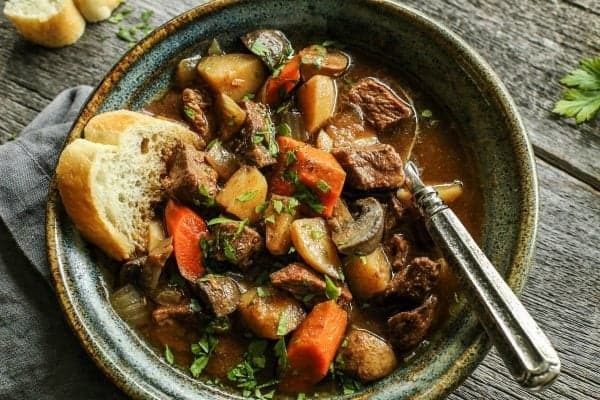 After talking with Mom and Cheryl about their memories of Hungarian goulash, it became clear that it’s really just a simple stew of beef and vegetables. With a heavy dose of sweet paprika. 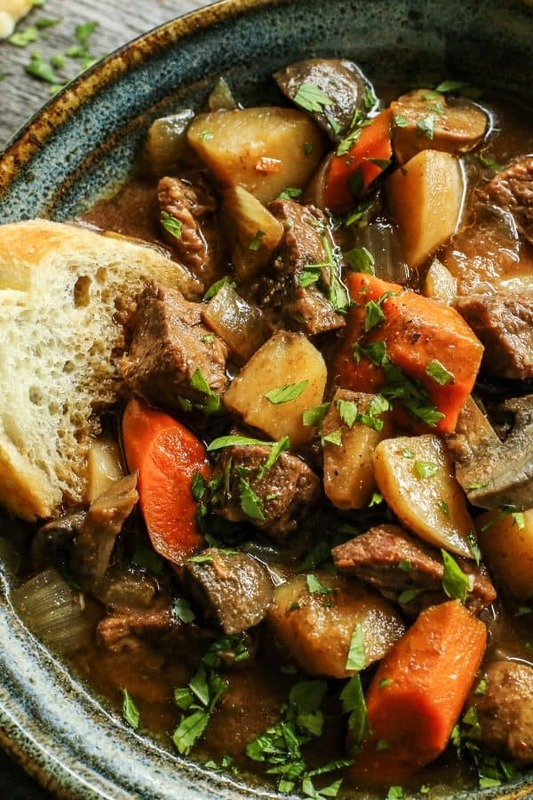 This stew could be simmered for hours on the stovetop. But I chose to let the slow cooker do the work. It’s incredibly easy to make this Hungarian goulash recipe. Simply place cubes of beef roast, along with potatoes, carrots, and mushrooms, in the slow cooker. The beef will magically transform into the most tender bites, as will the vegetables. The broth is wonderfully rich and beefy, with a hint of tomato flavor. Which plays so well with the signature sweet Hungarian paprika that goulash is known for. 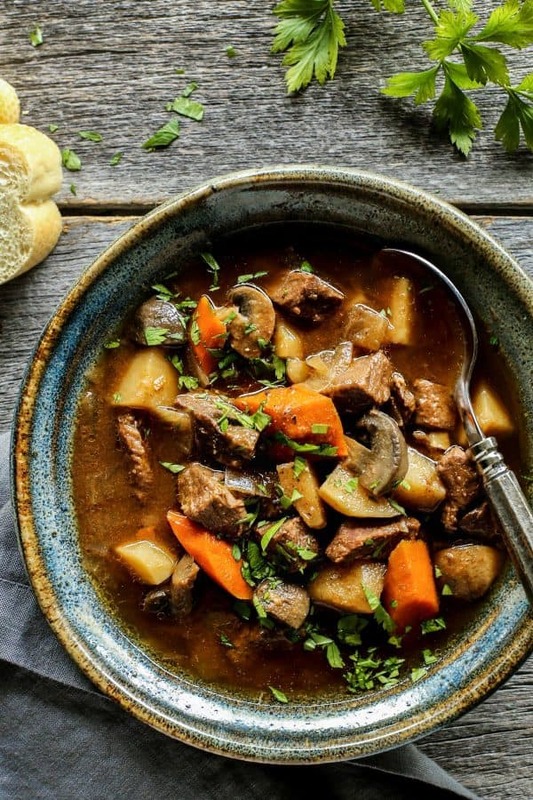 This is one beautiful stew, total comfort. I hope you like it as much as we do. 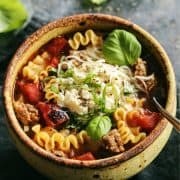 You might also like my Slow Cooker Beef and Barley Stew, this Slow Cooker Beef and Sweet Potato Soup, and Lasagna Soup! Like this Hungarian Goulash? Pin it! This humble stew is loaded with chunks of tender, melt-in-your-mouth beef and vegetables. A rich, beefy broth flavored with sweet paprika makes this a true comfort meal. Place beef in slow cooker. Cover with carrots, potatoes, mushrooms, onion, and garlic. In a medium bowl, whisk together remaining ingredients except parsley, and then add to the slow cooker. Stir a bit to combine. Cover and turn heat to high. Cook for 4 to 6 hours, or until beef is ultra tender (I usually plan on 6 hours). Serve in bowls with a warm loaf of fresh crusty bread. From my mom’s recipe box…heavily adapted from this recipe, with input from Mom and my sister Cheryl from their travels to Hungary and Austria. 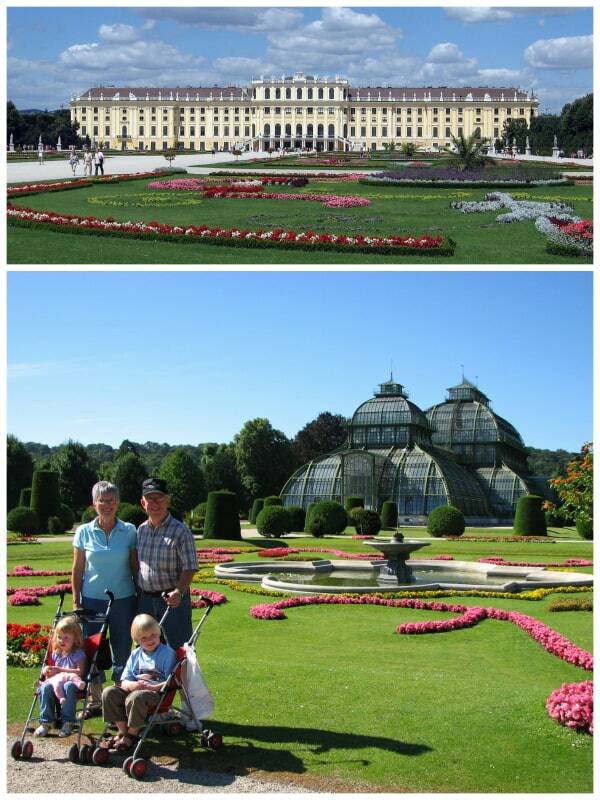 A highlight of their trip was visiting Schönbrunn Palace in Vienna. A former imperial 1,441-room summer residence, it is now a major tourist attraction. The grounds are meticulously kept, and are home to numerous gardens, pools, fountains, and sculptures…and a maze! Pictured on the left are Cheryl and Dave with their son and daughter in front of the Neptune Fountain at Schönbrunn Palace. The grounds also feature the world’s oldest zoo, constructed in 1752 (bottom right). 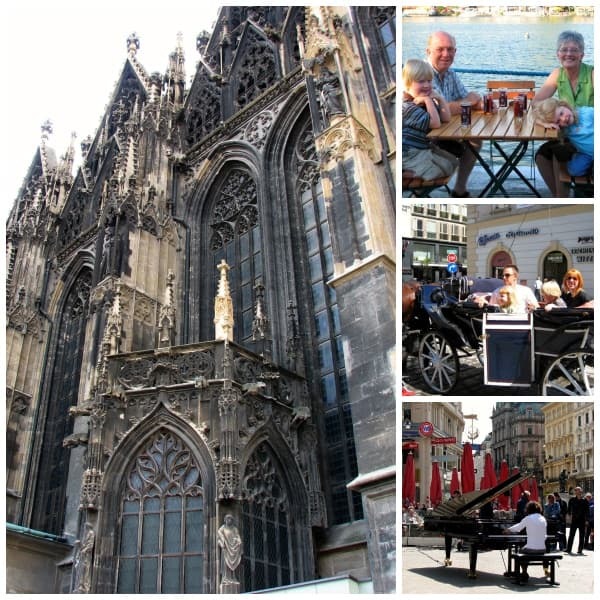 While in Vienna, they also visited St. Stephens Cathedral, a medieval limestone landmark. It was constructed in 1147 and named after the first known Christian martyr. Massive in size, sitting atop underground tombs, catacombs, and crypts, it houses 18 altars in the main part of the church, plus more in various chapels. I found information on the Schönbrunn Palace and St. Stephens Cathedral completely fascinating. As my dad always says, “google it”. The history on these places is amazing. Thank you to Mom and Cheryl for sharing your memories and your photos. This post was previously published in 2014. Photographs and some of the text were updated in 2018. This recipe helped us figure out how much we LOVE goulash!!! My mom used to make a slightly different version of this, but I have to say your version was just as good. YUM! Such a flavorful and hearty meal! This turns out rich and flavorful! Hi there! Thanks that you sharing your mom’s recipe with us. Every house has sin own recipe how to make goulasch. Your recipe remains me the mixtures of fransch bief de bourgeois and rague de Bolognese. Don’t worry it is no wrong at all to try different things. For the first you have to know that are two version of goulash in Hungary. The goulash soop, with carrots and potatoes it’s a thin soop. Than it’s a a Goulash stew, thicker and it’s a main meal with NO carrots and mushrooms. If you wana make an authentic Hungarian goulash stew you have to look the name: marha pörkölt. Good luck! János, my thoughts exactly. One thing to add: it’s really called Gulyás. I prefer to use the actual name of the meal, since it is Hungarian. 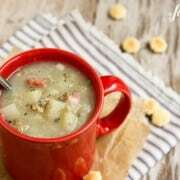 And the thin soup, usually does not have any other vegetable besides potatoes and the beef. I made this last Sunday and it was SO unbelievably delicious! 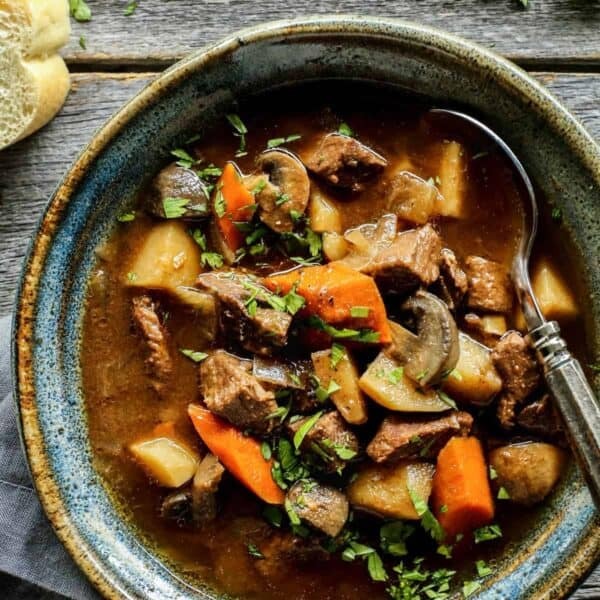 My husband loved the depth of flavors and having an alternative to a standard beef stew. I was able to find authentic Hungarian Sweet Paprika (yummm!) and also thickened the goulash at the end by stirring in flour whisked into beef stock. About 40 hours ago I was eating goulash in Budapest! And I brought home paprika – of course. This looks very similar to what we ate. The broth in ours must have been reduced a lot as it was almost thick (but not creamy). Thanks for the recipe! 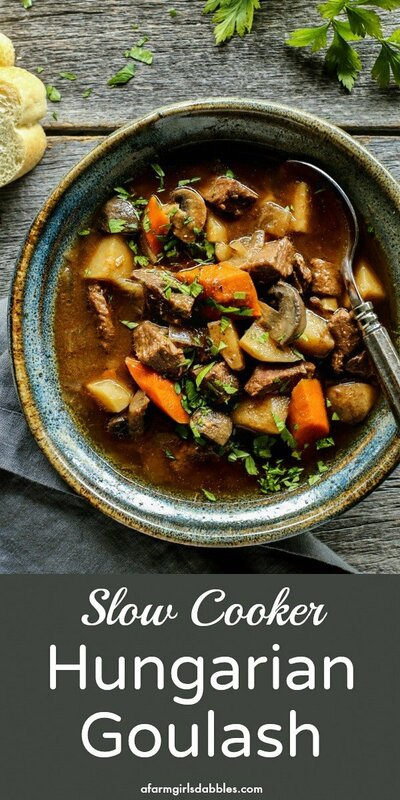 Just got myself a slow cooker and looked up hungarian goulash recipes, I grew up in Slovenia and my mom would make this dish quite a bit and I absolutely love it! She would make this with creamy polenta as a side – try it, you will absolutely love the combination! 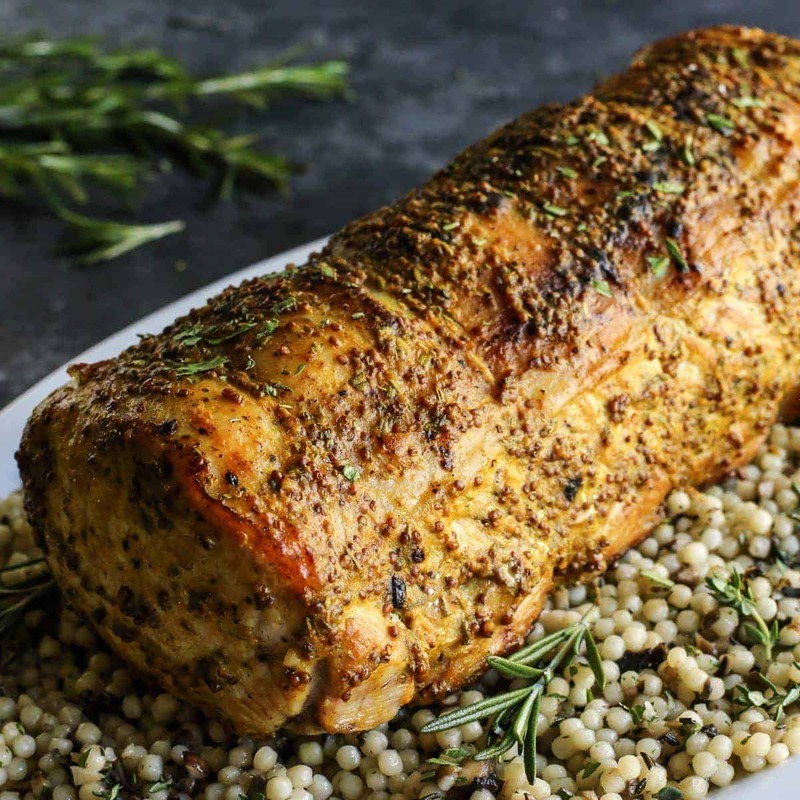 Thank you for the slow cooker adaptation, can’t wait to make this! Ooooooo, I definitely want to try that! Thank you for sharing. And I hope you like this! I made this today – great recipe, thanks for posting it! I used Trader Joe’s smoked paprika and added about a half bag of shredded cabbage (in the last hour of cooking). Not sure how Hungarian paprika tastes, but the TJ’s smoked wasn’t chili spicy at all. It came out really nice. I didn’t realize Hungarian paprika was a thing and just added regular paprika….anything I can do to save it from being to hard on us? I love to know you loved this. Thanks! My husband and I visited Budapest and Prague recently and had the most wonderful Hungarian Goulash. I have wanted to try to make it since we got back and found your recipe on line. Well I made it today for dinner, following your directions exactly and I’m sorry to say that I found it quite tasteless. It was such a disappointment and nothing like what we had tasted over there. 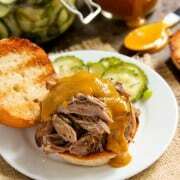 I agree, this recipe is currently in my slow cooker and I have added a number of spices trying to get some flavour into it. The paprika cannot carry it on its own. This is a wonderful stew!!! I have a Hungarian family and we love it!! I love to hear this. Thank you so much, Jennifer! My dear friend just returned from a trip to Hungary and brought me authentic Hungarian Paprika (I hope I find out that it is ‘sweet’ paprika which is what you used). I am 1/2 Hungarian and 1/2 Austrian due to my father being born in Budapest and immigrated to Austria in 1957 where he met my mother outside of Salzburg. I grew up with dishes such as Hungarian goulash and Austrian food. Both parents are deceased and I miss the foods of my childhood. Thanks soooo much for sharing your pictures and recipe. I can’t wait to try it! I read all the comments and I too am happy that it’s in a slow cooker. I may sautee the onions and beef for a little bit tho. 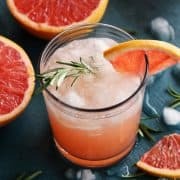 Great to find this recipe! Thank you so much for sharing, Elizabeth. I hope you like this! My mother in law recently passed away and she always would make beef goulash and I unfortunately never learned how to make it. 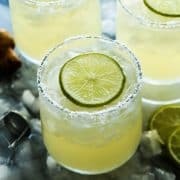 My husband asked if I could make this since the weather is getting cooler and I’m glad I stumbled onto the recipe. I will be trying this out this week in the crockpot but I was wondering if I cook it on low can I leave it for 8hrs or so???? Just returned from Budapest where we ate many bowls of goulash. I’m 1/2 Hungarian and my mom use to make goulash but of course I never had her recipe. I was looking for a crock pot version and came across yours. Thanks so much. I did bring sweet paprika home so will be using it. Hope it turns out as well as some of the ones we had in Hungary. And I hope my language wasn’t impolite.That wasn’t my propose. No worries, Erika. I had tweaked a recipe that my mom had found, after she had enjoyed goulash on a trip to Hungary and Austria. She said the recipe was the closest one she had found that tasted similar to what she had eaten on their vacation. Thanks for sharing your insight. I’m a hungarian woman.That’s a very good recipe,could be tasty. What an honor that you share this recipe as hungarian.But please,let me say that it’s not authentic and not traditional Hungarian Goulash.This one could be a German,Romanian, Austrian Goulash I guess or I don’t know.Your recipe contains so many(almost all) ingredients that Hungarian’s one doesn’t.Dry mustard,mushrooms,tomato paste(we use tomato not paste,different taste),Worcestershire sauce,brown sugar….Hungarian Goulash doesn’t contains black pepper authentically,because the beef gives that flavor to the soup that needs.But we usually use black pepper,so it’s not problem.Cooking technics is not fine as well.Shortly:First sauté the chopped onion in oil,add bay leaf, give just a little bit water,reduced the liquid,then add chopped beef,give them a stir,roast 4-5 minutes,add salt, garlic,Hungarian sweet paprika or some good quality one.Add chopped tomatoes and yellow bell pepper(TV (means good for stuffed pepper) pepper in Hungary)give them a stir,add water to reach the top of the beef.Reduce the liquid at least 4 times or more.That is one of the most important thing,never skip this.After At the last one(when the beef almost cooked) add the sliced carrots and sliced Turpin or Swiss chard,chopped potatoes, roast them with the beef,add water,black pepper and cook.It can be a soup,not a stew at the end. I’ve been making my Hungarian grandmother’s variation of this recipe for over 30 years. 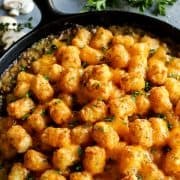 I found your recipe when looking for a multipot version. I wasn’t sure that it would taste like my grandmother’s, as your recipe has many more ingredients, but I thought I would give it a try. Made it tonight and my husband and I both love the layers of flavor that your version has. Fabulous. The only thing different that I did was to brown the meat in a little bacon fat first. Especially easy since my new toy has a browning option. Didn’t have crusty bread, but did have homemade dinner rolls to mop up the juices. Will definitely make this again. Thank you for sharing a great recipe and photos. Hello Carol – thank you for writing. 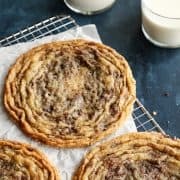 I love to know that you enjoyed this recipe! What size crockpot do you need? Well I can see that I’m a little late to the party but after searching the web, and all my cook books, your recipe looked just right. I brought home several bags of paprika from a recent trip to Budapest as well as delicious memories of the Goulash. I’m so excited…its in the slow cooker now! Out of necessity I had to make two changes, chicken instead beef broth and freshly sliced/sautéed mushrooms snatched from the jaws of the stroganoff currently on the stove. Is there anything I can add to make up for the chicken vs beef broth? I am really enjoying your blog…and your style! How exciting for you! I hope you find some good goulash! I’m really excited to try and make this! I’ve had goulash i Germany but this looks even better than that. I was wondering what size crock pot you used though because I only have a 4 quart one? Used chuck short ribs — meat turned out tender but did not fall apart, veggies were not mushy. BUT, 4 cups broth turned into 4 QUARTS in the 4-5 hours in the crock pot. If I ever make it again, I’ll add no more than 1 cup broth. My husband told me to throw out the leftovers which filled three quart jars. However, I shall try heating one quart of the soup/gravy and letting it evaporate and then add more of the seasonings. If you have a better idea, please let me know. Thank you. OMGGLHM!! (Oh My Goodness Gracious Lord Have Mercy) that was awesome! I just made this for dinner and we LOVED it. I made it in a Dutch Oven instead of the slow cooker since I was home all day. This is a permanent addition to our menu! Thank you so much for sharing it! You are the BOMB! Excellent! Thank you so much for coming back to let me know. Enjoy! I’m very excited anout this recipe! My grand parents are from Hungary and I’ve grown up on “old country” goulash (sometimes even done over a fire in a cast iron pot) :) Although there are few ingredients my grandma never used im interested to see how this recipe tastes. Im going to try it tomorrow, can’t wait to find out how it stands up to my nagymama’s! This is by far the best, and most authentic tasting, hungarian goulash recipe I’ve tried. The sweet paprika makes all the difference-don’t be scared by the (seemingly) high amount used. Love it, thanks! Thank you so much for your comment, Stacy. I’m so glad you liked this recipe! I’m sorry but it’s not authentic Gulas.But it can be very tasty,I’m sure. How big of a crock pot would you need for this? i have a feeling my 4 Quart crockpot is going to over flow! Hi! I’m Hungarian, so this is one of my favorite dishes. My only struggle usually is, that the beef needs to be cooked for a long time in order to become tender (this is preparing it in a regular pot). If I cook it in a crock pot will it be tender and moist? And if I put the veggies in the same time, cooking it for 5-6 hours on high, won’t it end up being mushy? The beef is definitely tender from being in the slow cooker. I don’t find the veggies to be “mushy”, just very soft. If you like them less soft, just add the veggies later in the cooking process. I’m so glad you liked this! Thanks for coming back to let me know. And…I think your adding red wine sounds wonderful! Dear Brenda, I am expatriate Austrian and I love your receipe. My mother made the stovetop version, but I love the slow cooker. We would eat it with small pickles on the side. There are lovely versions with game, when you serve it with lingonberries; cranberries would work, too. Thank you so much for writing. I love to hear all of this. I want to try the game versions, and with lingonberries! In the crock pot as we speak! Wonderful! Hope you liked it! I have a quick question – when you say “dry” mustard, do you mean dry in the way that we describe wine or champagne, or do you mean powdered mustard? Love this , my dad used to make something similar when I was growing up. LOVED LOVED the pics you added, what a beautiful place. Thank you so much, Patty. I hope I can see that corner of the world some day! I just put this in my crock pot but like others didn’t have the sweet Hungarian paprika BUT I did have Spanish sweet paprika hope it tastes as wonderful as my kitchen is smelling right now. I’ve eaten alot of foreign foods and I’ve only had it once but Hungarian Goulash is my favorite! I haven’t cooked in a very longtime I would have to say years and even when I did it was very rare. Though I eat extremely healthy I have found that even in healthy foods prepared by a store or restaurant there are certain ingredients you cannot avoid unless you cook for yourself. I have now prepared this dish and it is cooking right now. I am hoping it turns out good and that this is just the first of many dishes for me to learn to make well. Thank you so much for providing this recipe! I’m excited to try your recipe because it looks authentic. I spent much of my youth in Germany, and my dad loves to make Hungarian Goulash. We make it with German Spaetzle. I had a hard time finding smoked paprika in grocery stores, but found it in World Market and in Home Goods also. Where do you get the sweet paprika ? I saw “Smokey” and “Hot/Spicey” and just plain but no “Sweet” …. I lived in Budapest for a couple of years and I have to say, this goulash looks really authentic. Hungarian goulash is a lot more watery compared to what most people think as goulash. I’ll have to try your recipe for sure. That’s a beautiful compliment, thank you! I asked my sister and my mom alot of questions about it. Without actually having it for myself in Budapest, I had to go off of their descriptions and memories. If you try this, I’d love to know what you think. Where can you buy the paprika? 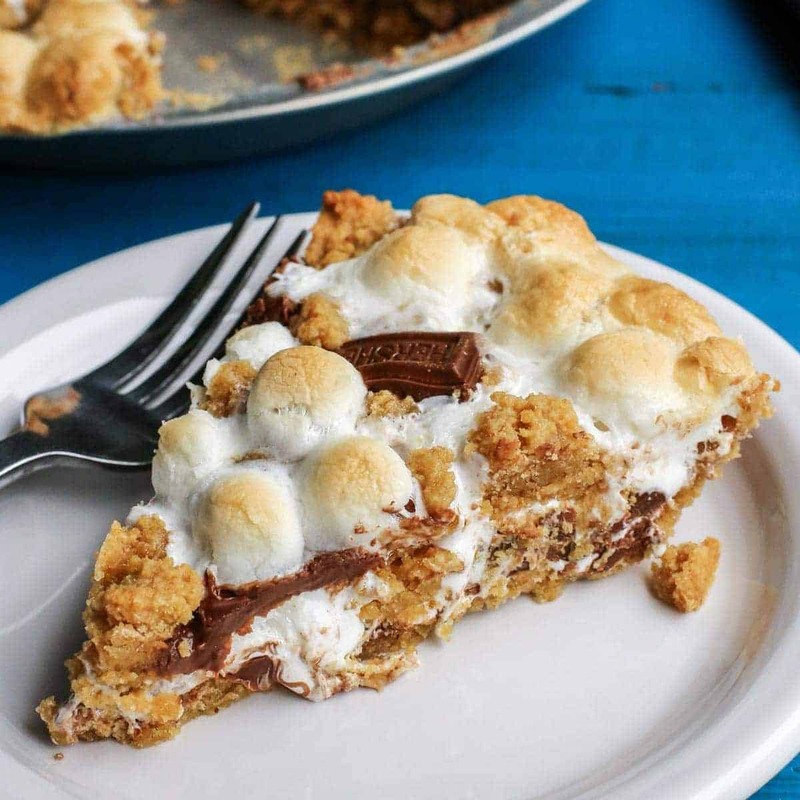 I am drooling over this recipe – gorgeous photos as well! Austria is beautiful! My grandmother used to make goulash when I was growing up…I am cooking this recipe tomorrow and I can hardly wait! I know it’s going to be delicious thank you so much for this recipe! I hope you like it, Becky! Thank you so much for visiting! 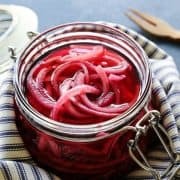 I am German and I grew up with this recipe! Your version sounds really yummy and I will give it a try! I sometimes add it to pasta or rice to make it even more filling. Well, I hope you like this! My dad likes to eat his goulash over mashed potatoes…a very warm and hearty meal! Beautiful post, both food and photos! My Mom and I visited the cities where her father had grown up – Prague, Vienna and Budapest – and had a wonderful time eating and exploring. Did you know that all three of these cities have Roman ruins? In Vienna, they are 60 feet below today’s city. They were found during a construction project. The history in these places is incredible! It’s hard to fathom ruins that far below ground level, but experienced that when we visited my sister’s family in Cairo, Egypt a couple years ago. Makes a person realize how “young” our country is!! Thank you so much for your comment! This looks so good on this cold winter’s eve. I have it in the crock pot right now. So excited for dinner tonight. I hope you liked it, Sarah! It was so fun to see how you put this post together Brenda, and it brought back so many wonderful memories. Now my mouth is watering for Hungarian Goulash!! I love this post and how it combines two of my favorite things… food and travel!!! Thanks for sharing such a special recipe. And Favorite Thing #3…beef! :) Thanks, Meredith! I loved reading this post and looking through the pictures. Very fun!! And the soup!! Sounds so great. I love the hearty, cozy flavors! What a wonderful comforting dinner. I know I would love it! Brenda, the recipe says 1/4 c. Hungarian Paprika is that right? Yes, it is, Wendy. And I used sweet Hungarian paprika, not regular paprika, so it really isn’t spicy. It’s just warm and flavorful. What a great recipe to post this time of year when all I can think of is comfort food, soups and stews. Using a crockpot is even better! Can’t wait to try this recipe! Happy weekend Brenda! So fun…I found this recipe on Pinterest and came to your blog and what did I see…Vienna! My daughter, son in law and grandson live there as missionaries and my husband and I went there this past summer for 3 weeks. 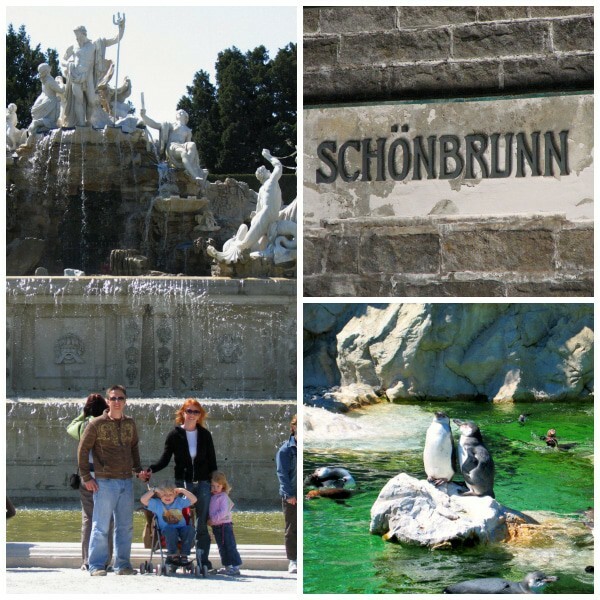 We went to Schonbrunn and it was AMAZING! Thank you Brenda for the beautiful recipes and pictures. Happy Friday and have a wonderful weekend! Would like to give this a try – but I don’t have Hungarian sweet paprika. Would the dish taste very differently if I use regular paprika? Yes, this would taste different. Regular paprika usually has more chili flavor to it = more spicy. The sweet Hungarian paprika is just warm and flavorful and very lovely. If using regular, I’d cut it back quite a bit.